Fusing slasher franchises, this hybrid of horror pits nightmarish Freddy Krueger against serial killer Jason Voorhees in the ultimate showdown after Freddy — stuck in hell — revives Jason as part of a plan to revisit the dreams of Elm Street teens. But Freddy’s demonic scheme spins out of control when the maniacal Jason begins his own campaign of terror. Robert Englund returns as Freddy, while Ken Kirzinger takes over the part of Jason. Two of my favorite movie icons battling it out. This movie would have to do something horribly wrong for it to be bad. In the end though it’s pretty good. 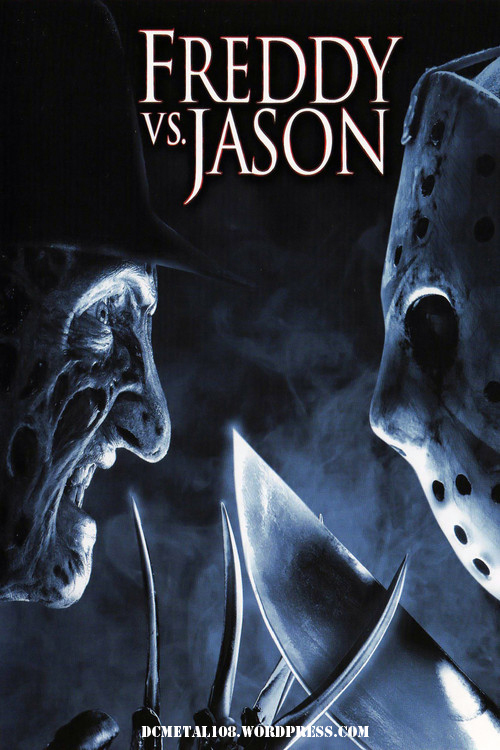 The story for this is decent enough with Jason and Freddy colliding in a way that makes a tiny bit of sense.The movie for some reason tends to focus way to much on the people though and not Freddy Vs Jason. The film often tries to throw random side stories into us that really have no relation to the film and could easily be left out. Thankfully though they got Robert Englund to return as Freddy but not having Kane Hooder as Jason doesn’t work. Plus Jason looks weird in this film. His head is all oddly shaped plus the back of his head is covered in like black plastic. The best thing about this movie is the violence and there is plenty of it. Freddy and Jason both rack up tons of over the top kills throughout the film leading up to one of the best fight scenes in movie history at the end battling , you guessed it, Freddy Vs Jason! The fight alone is a over the top gory battle. Overall if they would have focused the story on the guys more and got back Kane as Jason this movie would have been perfect. Otherwise it still is awsome. Freddy has a single kill in the whole movie. Re-Watch it and keep a tally.. it’s a very one sided body count list.